Having established herself as a versatile songwriter, vocalist, and producer with a roster of artists—most notably Leonard Cohen, with whom she’s collaborated for three decades and is currently on tour—Sharon Robinson could have just as well maintained a successful music career behind the scenes. Thankfully, she had other ideas. On her debut album, Everybody Knows, Robinson draws on the eclectic dimensions of her craft as well as on the breadth of her talent, summoning fractions of jazz and soul into a sound that is bound by neither. Through seven originals and three cuts previously co-written with Cohen (including the title track), she is at turns transportive and sensuously prescient, her smoky voice recalling shades of Sade while achieving an aura all her own. Amid ethereal soundscapes and muted, electronica-based arrangements, Robinson strikes an ambient tone that is well suited to the contemplative themes she explores. From the empathetic resonance of “Party For The Lonely”—its ironic refrain, “I think we should go,” reverberating in rhythm—to the soulful complexions of “Invisible Tattoo” and “The High Road,” she sings with equal conviction and wisdom. On certain songs, as on “Forever In A Kiss” and “Secondhand,” she creates a contrasted dynamic of live and synthesized instruments—like a piano progression set atop a subtle drum loop—further underscoring the album’s sophisticated allure. Lest anyone question whether Robinson is capitalizing on Leonard Cohen’s stature and present renaissance of sorts, consider that her musicality and production skills have informed some of his most celebrated works. And in the realm of lyrics—which she delves into quite deeply here—any semblance to Cohen’s pensive expressions isn’t one of imitation, but rather of a mutual ethic for rendering penetrating, visceral insights. Even on the songs co-written with Cohen—particularly “Alexandra Leaving,” on which she affects a more intimate vibe than the original—Robinson steers them into her own style, which in turn inspire altogether separate appreciation. 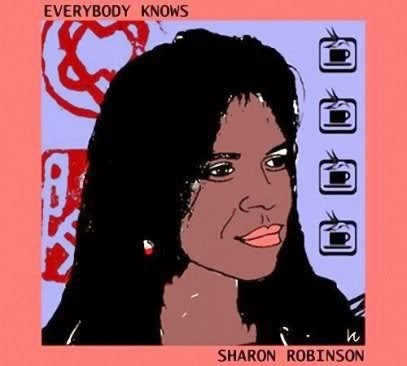 In fact, inspiring distinctive appreciation is what Sharon Robinson so exceptionally achieves with Everybody Knows, the result of having harnessed her creative energy and sensibilities to yield her own voice. I especially appreciate your review of Sharon's new album. One of the most frustrating things for me in reading reviews of Leonard's current tour is that Sharon is given mention within a single sentence, if not one shared with the Webb Sisters. There is SO much to Sharon and her incredible voice and skills that I always want to ask, "Can't you please just continue talking about her... please???" I love your review, Don... and that you were able to interview Sharon herself and share with her personally your very high regard. I was there in spirit, as I sat stone-still and breathless, as I watched and listened to her give such depth and breadth to Boogie Street. The comfort and high regard between Sharon and Leonard telescope from the stage. Sharon's performances, soloing or back-up, are so muscle-perfect professional. She IS her instrument and precise in every way. She's a joy to watch... and may everyone reading your blog seize any opportunity to do so. To meet her is an equal joy, as she engages so fully, enthusiastically, and naturally with each person. Consummate professional... Sharon Robinson.